Virginia Burt of Virginia Burt Designs is the recipient of this years Canadian Society of Landscape Architects President’s Award. The award was presented on the evening of October 19th by Past President Gordon Smith APALA, CSLA in Montreal. 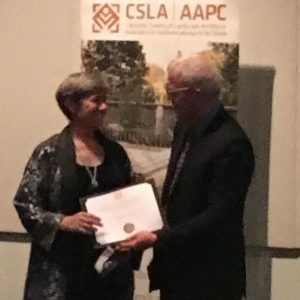 The CSLA President’s Award is the honour the President of the Canadian Society of Landscape Architects may bestow upon a CSLA member for outstanding contribution to the profession. The Canadian Society of Landscape Architects (CSLA) is a professional organization with over 1,980 landscape architects as members. As the voice of the profession in Canada, the CSLA is an advocate for its members on issues such as urban design, urban renewal, sustainable development and cultural heritage. Virginia Burt, FCSLA, FASLA, creates landscapes and gardens of meaning for residential clients, healthcare facilities, and academic and governmental organizations. Virginia graduated with honours from University of Guelph in 1985 and worked in offices in Aspen, Colorado and Toronto, Ontario before founding Virginia Burt Designs in 1996. Virginia’s love of the land, the inspiration for her work, began early in her life. Growing up on an apple farm Virginia developed a passion for being outside and understanding the rhythms of nature. For more than 30 years, Virginia’s design philosophy has reflected these roots, enabling her to create gardens and landscapes that reveal their natural context and sensitively reflect and support those who use them. Virginia is one of 7 women in the world designated as a fellow in both ASLA and CSLA.